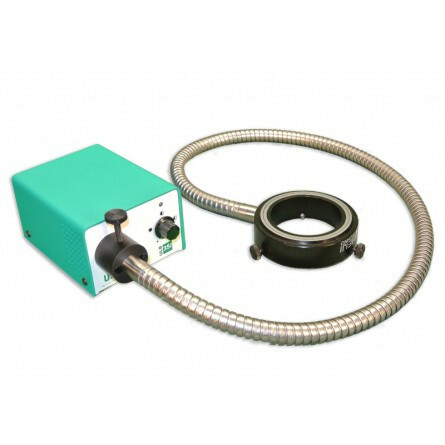 This American-made, professional fiber-optic illuminator provides 35 W of powerful LED illumination and is designed for both industrial and laboratory stereo microscope applications requiring Annular Ring fiber optic illumination. The 35 W LED light source is powered by conventional 110VAC and allows a continuous range of subdued or concentrated lighting, controlled by a rotary dimmer dial on the front panel. The fully self-supporting dual fiber-optic arms offer a wide range of positioning options, while a quiet, forced-air cooling fan helps to ensure a 50,000 hr service life. The LED color temperature is 6500ºK providing 1350 Lumens of shadow-free illumination. The FTM190's spectral output below 430nm (deep blue and UV) and above 700nm (near IR) is minimal, which makes it ideal for some sensitive applications. The Annular light guide features a flexible cable with 8mm dia. fiber optic bundle and a 60mm diameter ring aperture designed to fit RZ and EMZ stereo microscopes. EMF series microscopes will need adapter MA553, and EMT series will need adapter MA553/05. ETL, CE, RoHS compliant. Includes: FTM/115 - 35W LED light source with variable intensity control, FT190/10 Annular Ring light guide and 25mm adapter for boom horizontal arm. Dimensions: 3.5" x 2.7" x 5.0"